Like many women, I am not exactly happy with my skin. I've never exactly had a problem with wrinkles or smile lines, but acne has been a problem that has plagued me since I was 12. All throughout my teenage years I heard how most of it would clear up after puberty. Well, I am 30 and still waiting. It has never been bad enough for me to go to a dermatologist, but enough to make me uncomfortable about going out in public without makeup during bad outbreaks. While I have tried quite a few products over the years, most of them seem to be nothing more than marketing hype or, after drying my skin out too much, do more harm than good. When I heard about Apothederm, I was excited to try this line of products, and curious if they would make a difference, especially since they seemed to be a line of products that cared about not using harmful chemicals in their products. For the past three weeks, I have been using their new Apothederm Acne Clarifying Treatment, curious to see if it would actually help my acne. So, did it help or is this another product to avoid? While some people may think it's silly, I personally like to know a bit more about the companies that make my products. I have more than once boycotted companies due to their treatment of animals or refusing to stop using chemicals that hurt the environment. 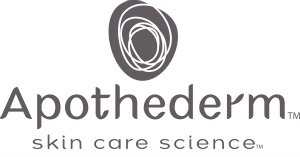 Apothederm is actually a fairly new company, having only been around since early 2011. Their parent company, Helix BioMedix, however, has been around since 1988, allowing them to make use of over twenty years of research to create a new line of products that are healthier to use, and more effective too. Every product made by Apothederm is made to be paraben free, pthalate free, fragrance free, free of formaldehyde releasing ingredients, and free of other dangerous chemicals that actually clog or damage skin. Overall, this makes the Apothederm line a better choice than many other acne treatments on the market if you are trying to avoid exposing yourself and your family to certain possibly harmful chemicals. To me, I was a bit happy to hear this, mostly since smaller pores mean less nasty black heads. Anything that can exfoliate dead skin and clear up blackheads is a winner in my book! Best of all, Apothederm Acne Clarifying Treatment is suppose to do this while still being gentle and not over-drying your skin. If you are anything like me, you have probably been grossed out and horrified by some of the acne treatments you have tried. I remember at one point trying this expensive acne treatment from a department store that smelled like some of the nasty chemicals I played with during chemistry classes in college. Not only did they smell terrible, but they burned and dried out my skin. Other products I tried just seemed like putting extra water on my face for three weeks. 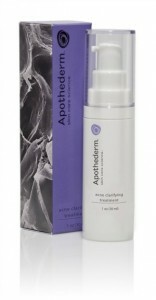 When I first started using Apothederm Acne Clarifying Treatment, I have to admit, I was pleasantly surprised. The product itself looks like an off white liquid that has the consistency of water, but has a bit of a sweet, yet strong smell to it. Not terribly overpowering, but enough that you know when you put it on. As the natural scent of the product, I have to admit, it isn't bad at all. Since I didn't have a full line of Apothederm products, I tried the Apothederm Acne Clarifying Treatment alongside my normal daily facial cleaner – Dermalogica's Daily Microfoliant. At first, the only thing I noticed about this product was that it was making my face much softer. While this made me feel quite confident, it wasn't anything to write home about. After three days of use, however, I started first seeing results. My blackheads on my nose were clearing up and looking much smaller. For me, this was quite shocking since I have found very few products that actually helped clear acne on my nose. After three weeks, the acne on my nose and the rest of my face is clearing up faster than with my normal cleaner alone. To test the product, I have only used once a day regularly, but have used it twice a day on rare occasions when I exercise at night or get sweaty. Since you can use Apothederm Acne Clarifying Treatment as often as three times a day, I expect it would work much faster if you have worse outbreaks than me. Overall, I am fairly impressed with Apothederm's Acne Clarifying Treatment. Not only has it decreased my acne, but seems to work great alongside the other products I use daily for cleaning my face. After three weeks of use, I would give this product an A rating and consider it a great product for anyone who is needing to get rid of troubling skin blemishes. Since I am considering purchasing more Apothederm Acne Clarifying Treatment for myself, I had to see who offered the best deals on this product. Currently, you can purchase Apothederm products on their website, or you can buy this acne treatment on Amazon.com. Both sites are offering the 1 oz bottle of Apothederm Acne Clarifying Treatment for $32.50. If you are someone who has trouble with acne, I highly recommend this product! Also, Apothederm has a variety of other products, meant to assit you with not only clearing up acne, but age marks and stretch marks. 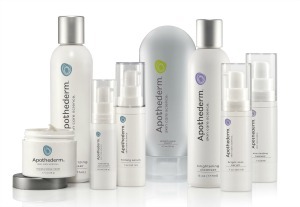 If you are wanting to try quality products that will help you feel more confident about yourself, give Apothederm a try! 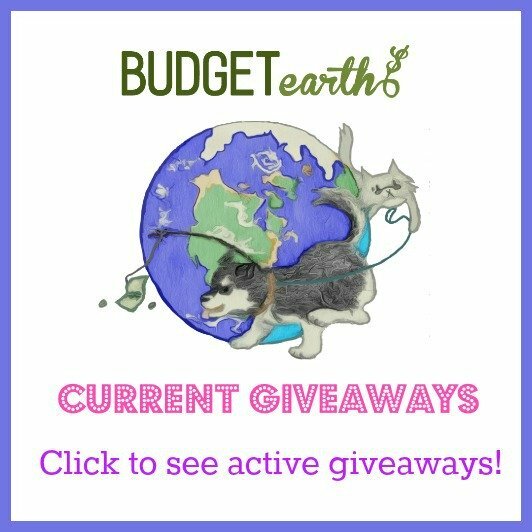 Disclosure: Budget Earth did not receive monetary compensation for this review, but did receive a bottle of Apothederm Acne Clarifying Treatment for review purposes via Tomoson.com. All of the opinions on this blog are the opinions of said author and these opinions may differ from your own. I too have suffered from acne since I was about 11 or 12. I hate it! Now that I'm in my 30's my skin has gone nuts and went from oily to dry. I'd love to find a product that doesn't dry out my skin. I have been looking for a product for my daughter to use. I will have to look into this company. Thank you for another wonderful review. Thank you for this good review. I am going to look into this for my son. He has spuratic breakouts but also has sensitive skin. Other treatments are a little harsh for him but this sounds like it would work for him. I have a younger sister who suffers from acne I will have to share this with my mom and see if it works for her. Wonder why they don't list ingredients. It really drives me nuts especially the all natural lines not listed the ingredients online. I wish they had this when I was a teenager ha! Sounds like a really great product that really works, thanks for the review. Sounds amazing! and reliable! I would love to try it out… I had bad acne growing up and now I only get one or two sometimes, rarely.. but bad memories though! You did a really good job at writing this review…I can tell you really tried out the product…not just another company review you reviewed the product! Thanks! Good to know of some of the other good products out there and I know someone who I will pass this on to that will be interested. Thanks! I think I saw someone else who recently reviewed this product as well. I'm always on the look out for an acne product that I can use because I get stress acne bad. This product looks awesome! I would loved that when I was younger. I suffer from mild outbreaks during "that time" and would love a solution to battling the problem. I'll have to check out their products. When I was using the product, it did a pretty good job. The bad part of being a reviewer is that I am constantly using new products and having to give my face a rest between products. My go to product on bad days is still Mia Mariu but this is what I usually bring with me while traveling since its super easy to use and effective.